Although it might seem like there’s a sharp divide between mainstream comics and indie fare, a spate of strong indie work has recently delved into genres usually associated with bigger publishers. When a new generation of creators who grew up reading everything enters the market, the results are undeniably postmodern, the cartoonists taking whatever they like as material. 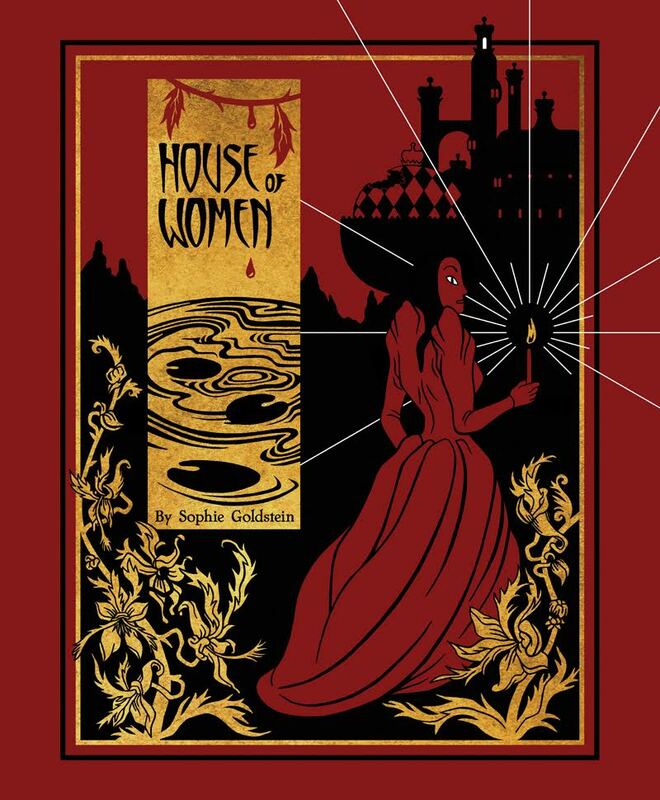 Sophie Goldstein’s sci-fi book House of Women is exactly the kind of product that fits into this progression. Alternately spiky and luscious, it draws you in by receding. She writes with economy, but the resulting story isn’t irritatingly arty or hard to follow; it’s not drawn by a comics artist only for other comics artists who speak the lingo and can read the subtext. It’s no surprise, in fact, that Margaret Atwood (restless, relentless experimenter, unafraid to leap into any genre that grabs her interest, including comics) is an inspiration for this female-centered and complexly feminist story of colonization and controlled social dynamics. Goldstein provides no easy answers—the book is thematically driven rather than focused on plot first and foremost—but she knows how to be just difficult enough. 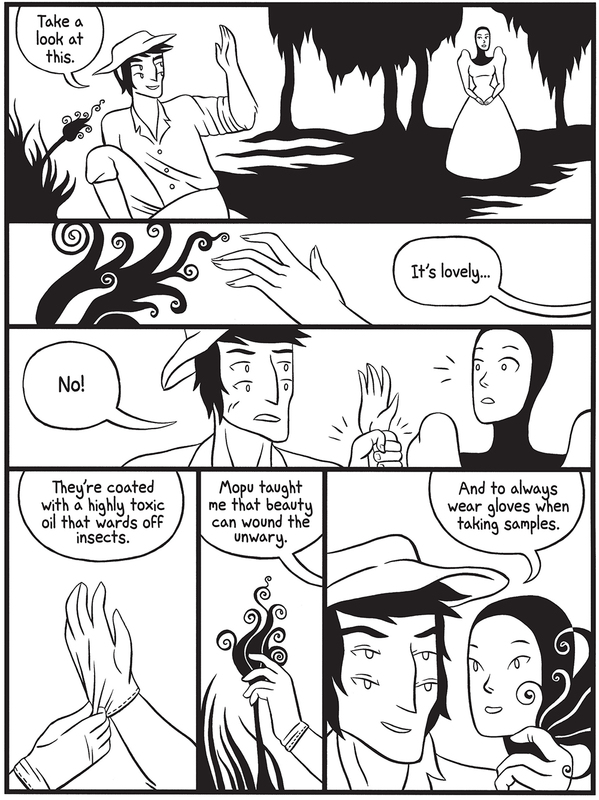 She emailed back and forth with Paste for a few days about various inspirations, how she ended up deciding not to get a PhD in English (and instead to make comics! ), book design and whether she’d want to travel into space. Paste: You published this book as minicomics first, right? Did you revise anything for this collected edition? 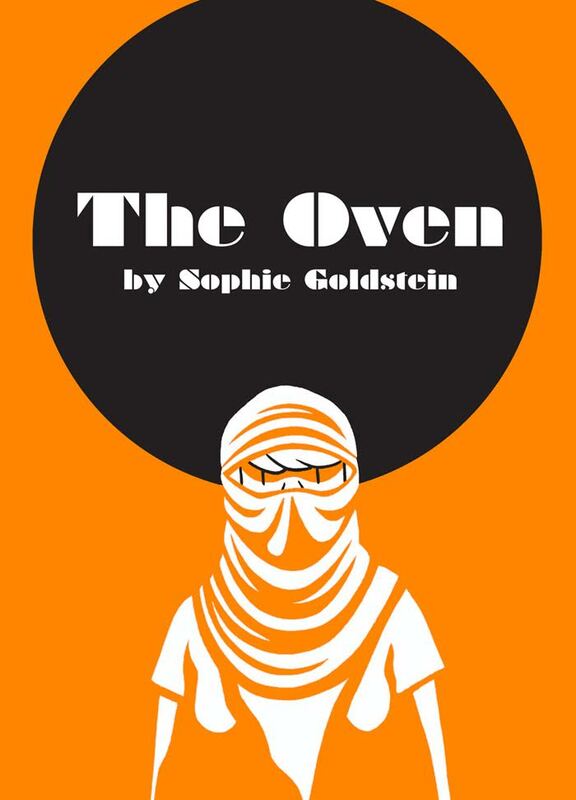 Sophie Goldstein: I considered going back and revising some of the art, especially in the earliest pages, but I ultimately decided that re-drawing any aspects of the book was a black hole I didn’t want to get sucked into. 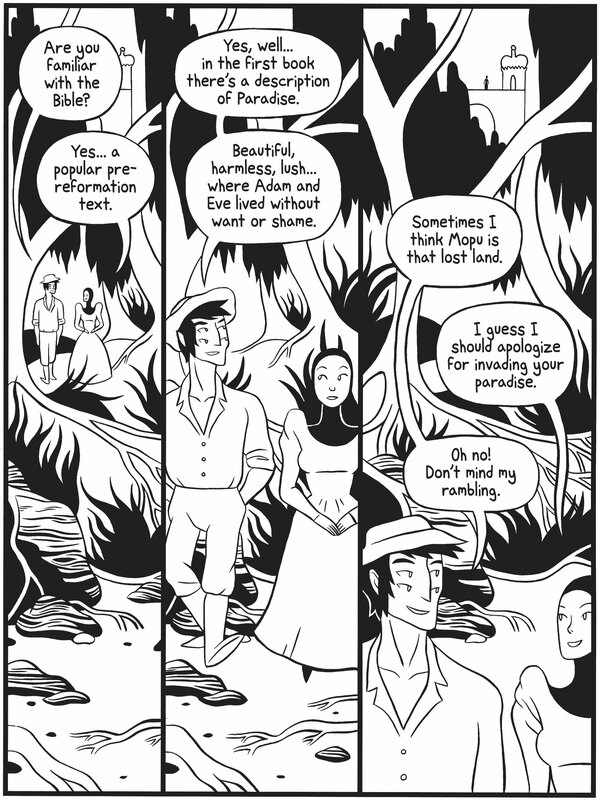 I did do a lot of very small edits on the pages—cleaning up smears and stray pen marks that I missed, and so on. Also, there were a couple faces I edited that felt off in the mini-comics… So I guess I did end up doing some editing. Most of the effort went into the packaging through: designing the cover, selecting the materials and end-papers, drawing the title page and section headings, etc. Paste: Did you have the whole narrative planned out from the beginning? Or did it evolve as you went along, producing each individual part? Goldstein: The plot of the book is loosely based on an older movie from 1947 called Black Narcissus, so that gave me a narrative framework to hang everything on. The inclusion of certain science-fiction elements generated most of the deviations from the film, and I did have those in mind early on. Even though I knew the broad strokes of the plot, I wrote each part as I went so the climactic scene at the end of the book was quite different then what I’d originally envisioned—in truth I was pretty delighted with myself. Gleeful, even. Paste: OH DUH Black Narcissus. That makes total sense (nuns hothouse colonizers + lush, free environment). Except that movie is super notable for its color, and you’re trying to do it all in black and white. Why? Just because it’s easier to do mini-comics in one color? It’s like you put all that color energy—which is also totally characteristic of ukiyo-e print—into the character design and the environment, and it’s hanging out there underneath the surface. Goldstein: The choice to make the mini-comics black and white was cost-driven, as you inferred, but later on, when I was pitching the finished book to publishers, I decided to stick with it because I just liked it. Sometimes I think of a color as a bit of a cheat; good coloring can mask bad drawing. It can mask good drawing, too. I generally prefer black-and-white editions of comics to their “colorized” versions, like Jeff Smith’s Bone. I also find coloring to be immensely time-consuming so that was another deterrent. It can take me three times as long to color something as it can to draw it, even if I’m using a limited palette. Goldstein: You’ll be unsurprised to hear that Jaime Hernandez is a big one for me, as for so many others. 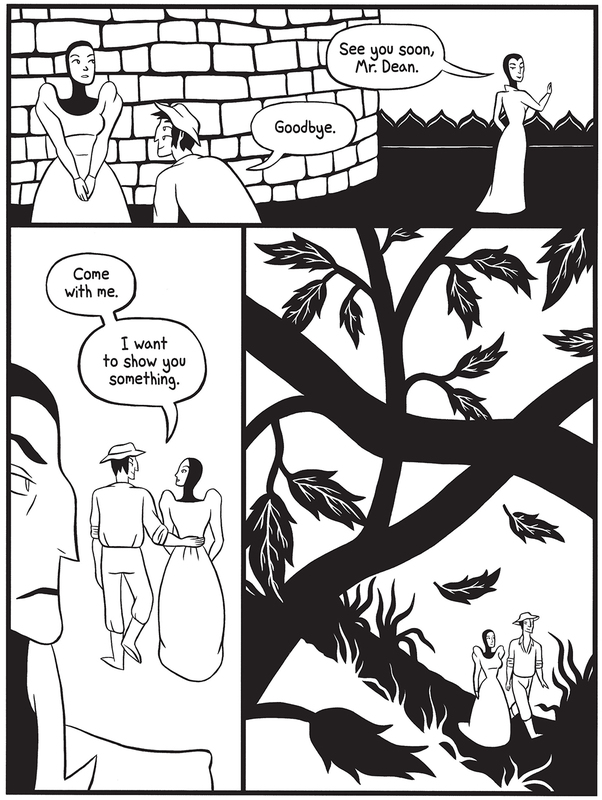 I also really love Liz Suburbia’s work—both her line and her balance of black and white. Although his comics are colored, I also learned a lot about spot blacks from Mike Mignola. There are many other cartoonists I love who work primarily in black and white but those are the few whose work I truly studied—the rest are all early-19th-century illustrators and painters. Paste: How did you go about character design, not only visually but in terms of their personalities? Goldstein: The characters are archetypes so I wanted them to visually reflect their character traits. To this end I chose to align each of them with an element. Sarai, the protagonist, is water. Rhivka is fire. Aphra is wood and Kizzy is air. It doesn’t enter overtly into the story but it did guide my costume and character design choices, and there are scenes where you see each of the women in their elements. I also thought that it was important to give each woman a different silhouette, so I could draw them at different sizes and still have them be identifiable. Since they wear a uniform there was some risk of having people confuse them but I think I managed to differentiate them sufficiently. Knock on wood. Paste: Aubrey Beardsley: fan/not a fan? Goldstein: Oh, a massive fan! I have a book of Beardsley’s art and that was my starting point for figuring out how to draw House of Women. I have pages and pages of copied drawings from his illustrations in my notebooks. From him I expanded to looking at Art Nouveau more generally (Klimt, Mucha, Schiele, Toulouse-Lautrec) and from Art Nouveau to the ukiyo-e Japanese prints that inspired that movement. Paste: I kept thinking about The Beguiled (the original Don Siegel movie, not the Coppola remake) while I was reading this book, mostly because of the kind of hothouse atmosphere, where you have all these women thrown together who are supposed to be keeping themselves pure and focused, and then a charismatic man is introduced into the situation, throwing off the dynamics. Is that way off? Have you seen the movie? Goldstein: I have not, although I have seen the remake that came out recently. It definitely rang some bells for me although I think the dial never went past 7 on the Coppola film… I should definitely check out the original! Paste: One of the things I really like about this book is your lack of exposition. It’s never totally clear what this world is, why the women have been sent on a kind of missionary trip to educate the natives of this planet, where they come from to begin with, when the story takes place, etc. I assume that’s by design? Goldstein: Yes, absolutely. Early on I toyed with the idea of having an exposition-heavy scene on their home world, where Sarai, the mission leader, is getting her orders from the high-ups. It just didn’t work, though, and felt unnecessary. As a reader, I hate being hit over the head with exposition, so I would rather trust my reader and leave some people confused then over-explain. Perhaps I would make different choices if I were a different kind of science-fiction writer, but my focus is on the emotional and moral journeys on my characters—not the mechanics of the world they live in. All you really need to know about the world they come from is that it’s somewhat repressive, which I think the hoods and repetitive platitudes convey pretty well. In my mind, theirs is not an explicitly religious order, although it may descend from one—hence the habits and the Hebrew names. It’s basically Starfleet without the Prime Directive. Paste: Tell me about what you imagine to be the gender balance in this universe you’ve created. All the colonizers are women, but is that the case throughout your imaginary world? Goldstein: No, I don’t imagine they come from an all-female matriarchal culture. In fact, the original colonizers were men…something I allude to in the art remnants that remain scattered throughout the castle. I don’t give a lot of explicit information about the world the women come from, but hopefully there are enough hints for a reader to be able to piece something together about what happened to the first expedition. Paste: You were an English major in college, right? How do you think that influences the comics you make? Goldstein: I have a BA in English from NYU. The two main categories of books I read are science-fiction and British literature, and I think that comes through pretty clearly in House of Women. One of my all-time favorite books is Remains of the Day, by Kazuo Ishiguro, which is a beautifully understated book about an aging head butler set in the waning days of the British elite after WWII. The book is written in first person from the point of view of a character who is basically a stranger to himself and who utterly lacks emotional language and I think that’s very powerful. I try to bring that kind of writing into my own work, and I think there are some quiet emotional moments in House of Women, along with moments very much the opposite, of course. Paste: Do you read (or have you read) a lot of sci-fi? If so, can you name some favorites and/or some works that you think have influenced you? Goldstein: I probably read more prose than comics, especially since there are so few science fiction comics in the vein of what I’m interested in. I’m very much a fan of Ursula Le Guin (Left Hand of Darkness), Margret Atwood (The Handmaid’s Tale), Octavia Butler (The Lilith’s Brood Trilogy) and Mary Doria Russell (The Sparrow). In more recent years I’ve gotten into the work of Ted Chiang, China Mieville and Iain Banks. When I was much younger The Time Traveler’s Wife, by Audrey Niffenegger and Nightwings by Robert Silverberg were two books I read to shreds. 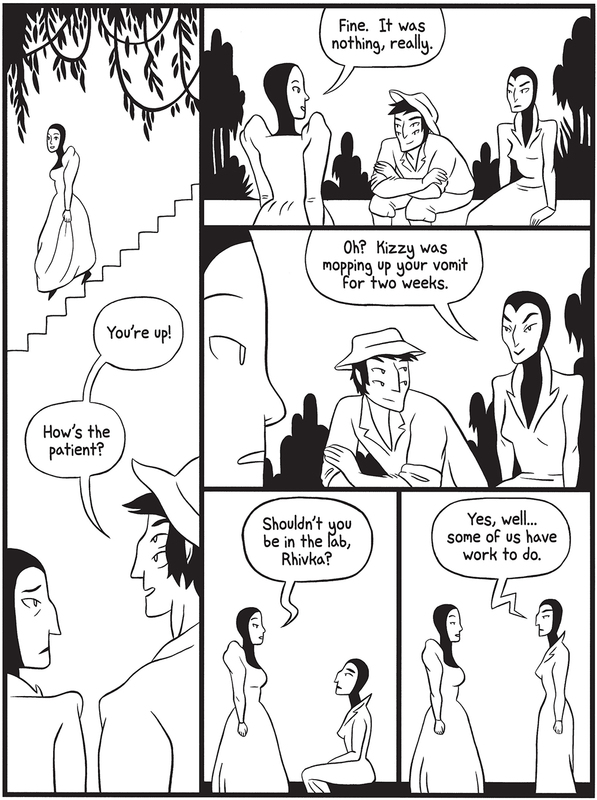 Paste: How did you move into comics from getting a degree in English? And does anyone give you grief about it? Goldstein: My intention after finishing college was to go on and get a PhD in English, but I decided to take a year off before applying to programs. During that year, I worked as an administrative assistant in a master’s program department at NYU and I got a front-row seat to the stress of being an adjunct faculty member; the life just seemed really unappealing. Then, I was so bored at my job I decided to enroll in a few continuing education night classes at the School of Visual Arts, where I had the good luck to be taught by Tom Hart and Matt Madden. I had majored in English because I wanted to be a novelist, but I ended up developing a massive case of writer’s block—I just couldn’t turn off the critical parts of my brain I was developing in my classes. Comics offered me a way around that, somehow. 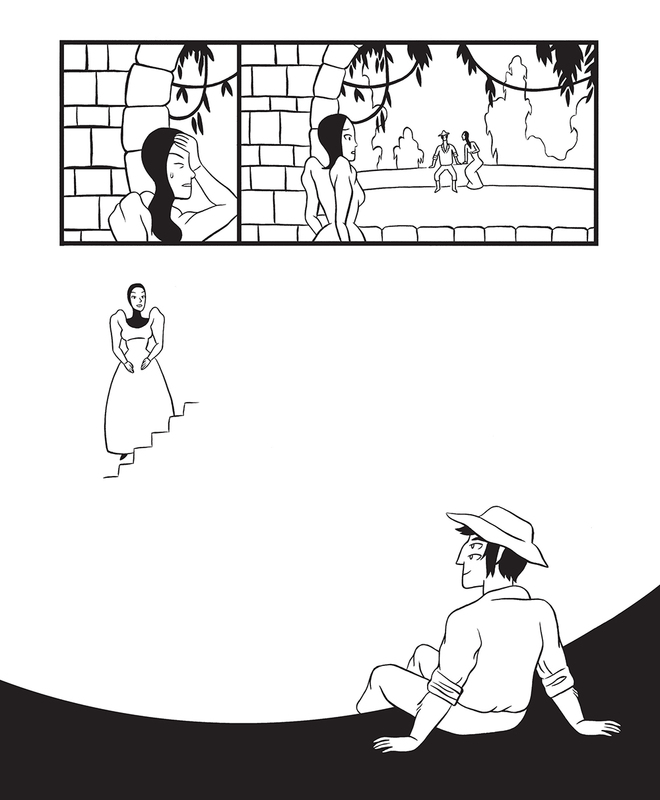 Soon after the second class I started a webcomic, co-written with my friend Jenn Jordan, and that was pretty much that. Two years later I was at CCS. I’m pretty fortunate, as an artist, to have very supportive parents. My mom and dad met in New York as struggling actors and even though they divorced and moved on to other pursuits, I think that past paved the way for me; wanting to be a cartoonist is no more ridiculous then wanting to be an actor. My mom enrolled me in art classes when I was a kid and my dad bought me stacks of schlocky fantasy and SF novels from the used book store and Archie digest comics from the spinner racks at the grocery store. My mom still writes and my stepdad is a costume designer and my stepmom has pursued acting and singing. Being an artist was never a ridiculous thing for me, growing up. Paste: So did you want to get a PhD in creative writing? Or you just loved studying English? Goldstein: Nope, just a regular academic PhD. I did love reading and analyzing text but ultimately I decided it would be more fulfilling to be a creator then an academic. Paste: Do you think any of the covers from those schlocky sci-fi/fantasy books influenced your art? Goldstein: Probably! I definitely enjoyed looking at them, however tentative their relationship to the text of the book. I particularly love the covers from the ‘60s and ‘70s. I must have had a vague memory of a particular Dune cover in the back of my mind when I was making The Oven, because when I saw the cover again, the relationship was obvious. My dad gave me that book when I was around middle-school age and it made a big impression on me, as it had for so many others. Paste: Talk to me about picking endpapers and materials and cover design. As a literature person, I’m going to assume you’re a big ol’ nerd about a beautifully made book. Goldstein: I do love a pretty book, but in prose it’s never been a big sell for me—I prefer softcovers to hardcovers and I never liked book jackets. I think with comics though, because there are pictures, the book-as-object is more essential to the reading experience. Also, we live in a digital age so you really have to give people a reason to buy your analog book. Before I went to CCS I would make the shittiest mini-comics you can possibly imagine…just so lazy. I never thought or cared about cover design until Alec Longstreth hammered it into my head that people need an attractive cover to make them want to pick up your book. It had honestly never occurred to me! Now, I think of the cover and other “packaging” aspect of the book as part of the story-telling and world-building. 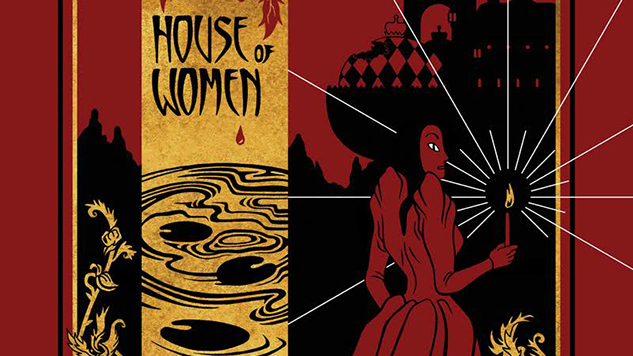 The House of Women cover is inspired by an art nouveau-style book cover I found on Google image search designed by Alexandre Riquer. I loved the balance of the colors and shapes. For SPX 2012, I drew a version of it as a cover for a compilation of House of Women concept art. I loved it enough to return to it again when it came time to design the Fantagraphics edition. Paste: If you had the opportunity to go to another planet, would you? Goldstein: Realistically, no. Anyone going to Mars on one of Elon Musk’s colony ships is in for a life of incredible deprivation and hardship. I honestly can’t imagine never being able to breathe fresh air again or feel a breeze. I suppose if a return trip was guaranteed, I would go, but it would be a very risky and expensive business. Also—there’s no life out there, that we’ve found, and there’s so much of it on Earth (for now). When I think of the variety of landscapes, wildlife and cultures on this planet and compare that to what I will probably experience in my own short time on earth, I feel very keenly the smallness and insignificance of my own existence. There are people whose experience of life is so radically different from mine that they might as well be living on another planet. That’s much more interesting to me than seeing Jupiter out of a 5-inch-thick portal window.